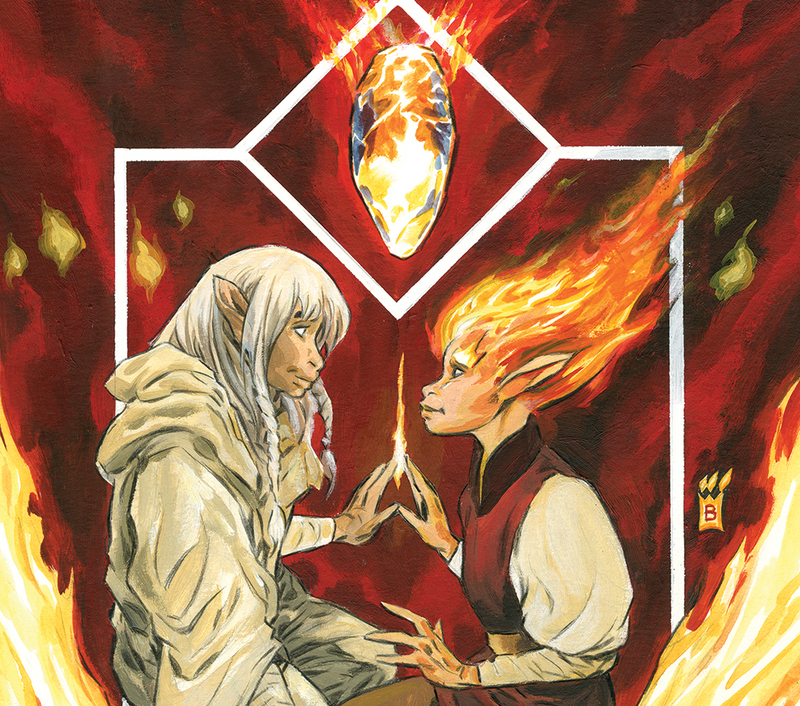 The Power of the Dark Crystal #11 Review – AiPT! A fantastical escape that lets your imagination run wild. Mother always knows best or so people say. 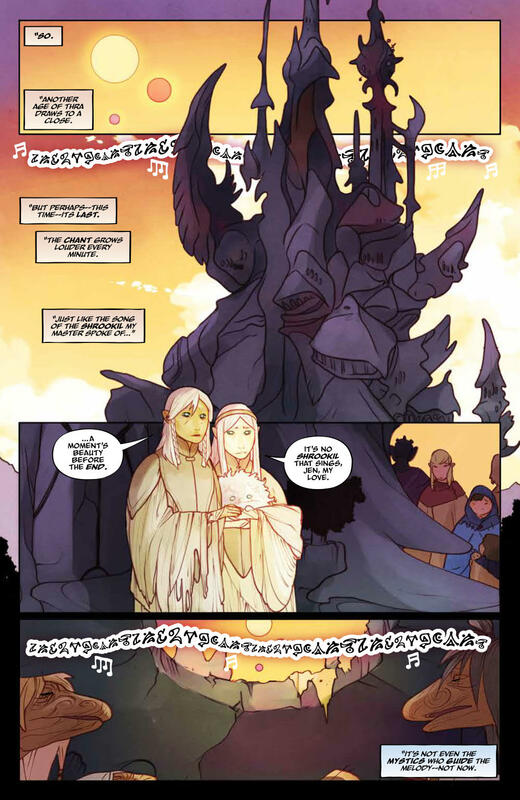 The Power of the Dark Crystal #11 reminds of the advice of two influential mothers “When the mind is unclear, listen to the heart.” This guidance must hold some merit for it is the same message from two distinct worlds. We have been reading this story assuming that the two worlds were the physical world of Thra above and the Fireling world below. This may have been too literal of an interpretation. Perhaps the prophecy is a telling of the emergence of a new, unified world with new leaders. The world of corrupted crystal worship needs to die for the new world of acceptance and love to thrive. The intolerant Thra that was so divided it drove one of its own people underground, dividing a people into two worlds. Their history of narrow-mindedness has been uncovered. Thra has been spoiled from the core by an ancient bigotry and corroded above by greed and the thirst for power. All of this cruelty has been slowly poisoning Thra. Thurma and Kensho accepted each other immediately and whole heartedly despite being form two very different worlds. They looked beyond the surface to each other’s hearts. This is where they found the purity in each other’s actions. When their minds were unclear they listened to their hearts. There is a heartwarming scene when Thurma is reunited with her mother. A few precious moments in each other’s arms as a mother bestows one final gift upon her daughter. It cannot be easy to capture emotion in a face made up of flame yet Kelly and Nichole Matthews execute this beautifully. You feel Thurma’s anguish and turmoil. Thurma embarked on a journey that was meant to save her people and despite all of her fervor she has arrived home too late. She desperately wanted to save everyone and now the most important person to her is gone. We can only speculate about what lies next for Thra. A great conjunction is upon them, one that even Aughra did not foresee. But as we know from our Dark Crystal lore the great conjunction brings great change. We just need to wait with bated breath for one more issue to see what those changes will be. Did I like it? 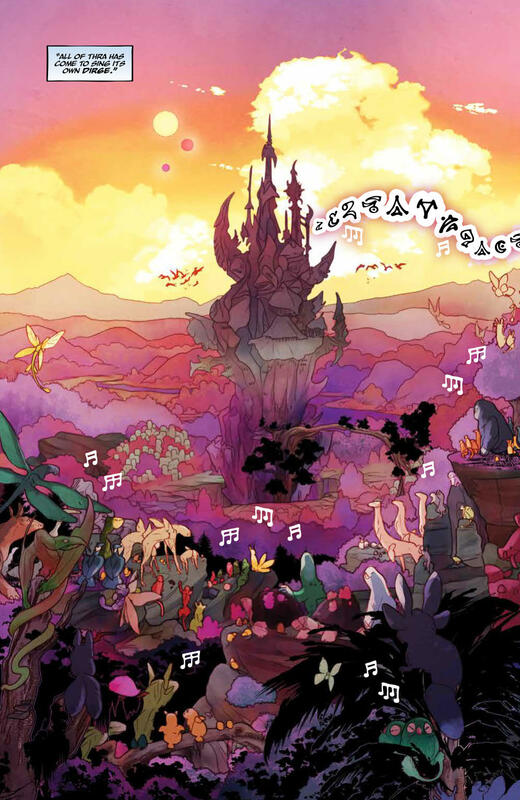 The Power of the Dark Crystal is a fantastical escape that lets your imagination run wild. Thra is singing its final dirge. Will you join in?